This much was confirmed in late May when Swiss police raided a luxury hotel in Zurich and left with 14 high-ranking FIFA members in custody. Comprised of both current and former FIFA officials, the men were charged with “rampant, systemic, and deep-rooted” corruption following an investigation by the FBI. The initial spark for the inquiry came when FIFA announced the hosts of the 2018 and 2022 World Cups as Russia and Qatar respectively. Accusations of bribery and fraud immediately followed the association’s announcement. The awarding of a summer soccer tournament to a Middle Eastern country was especially baffling, with temperatures in Qatar rising as high as 120 degrees in July. 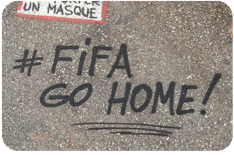 FIFA conducted an independent investigation of the bidding process but refused to release its entire report. Instead, they issued a synopsis that totally exonerated the organization, angering the report’s original author so much that he resigned in protest. While the FBI originally intended to focus on the World Cup bidding process, apparently the evidence of corruption against FIFA was so great that investigators are now looking at their dealings over the last 20 years. In a 47-count indictment, the FBI charged FIFA officials with not only accepting bribes for the two future World Cups but also several tournaments past. What’s more, the scandal could soon include the names of big companies like Nike who allegedly had to play by FIFA’s underhanded rules to advance in the world of soccer. Ultimately, though, many things remain uncertain about the investigation, including the fate of longtime FIFA president Sepp Blatter. The Swiss executive was not among those who were arrested in May, although he eventually stepped down from his position as the heat increased. What happens to him and the rest of his cronies remains to be seen, so stay tuned. Why would a company such as Nike have legal problems for following FIFA’s practices? What do countries hope to gain by paying large bribes for the World Cup? Source: “FIFA Corruption Crisis: Key Questions Answered,” BBC, June 17, 2015. Photo by: Thierry Ehrmann.